Yes! 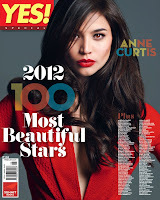 Magazine reveals list of 100 Most Beautiful Stars for 2012, as featured on its July 2012 issue. On top of Yes! 100 Most Beautiful Stars 2012 list is "Showtime" host and 2011 Box Office Queen Anne Curtis, who now joins the ranks of Judy Ann Santos, KC Concepcion, Marian Rivera, Kim Chiu and John Lloyd Cruz who have also topped the list in previous years. It was in 2007 when Yes! Magazine first came up with the "100 Most Beautiful" list and for 6 consecutive years already, these stars have consistently made it: Angelica Panganiban, Bea Alonzo, Gerald Anderson, Iza Calzado, KC Concepcion, Kim Chiu, Marian Rivera and Piolo Pascual. Meanwhile, Sam Milby who made it non-stop from 2007 up to 2011, is now missing on this year's list. 'The Healing' Movie Trailer - Scary!! !